My affinity the past decade has gradually turned from the classical Disney formula to the seemingly more inventive storytelling of Pixar. However, Beauty and the Beast certainly has all the makings of a great Disney film, and it is perhaps one of the last classics to come out of the canon. As per usual, the story gets its inspiration from books and fairy tales. This time from France. Of course, any good fairy tale must have a prince and this specific prince was unfortunately turned into a great ugly beast by an old woman-turned-beautiful enchantress who he insulted. After that trauma, he is resigned to that awful fate until he learns what true love is. Until then he lives locked away in an enchanted castle with no human contact and only a magic mirror to gaze into. Belle is the most beautiful girl in her little French village where she devours book after book and deflects the increasing advances of the handsome yet conceited Gaston. She lives with her quirky father who has a knack for crazy inventions. One such contraption actually works and he rides off to show it off, but on the way he gets lost out in the wilderness. Lo and behold he ends up at the Beast’s fortress and is soon imprisoned. His daughter goes after him and receives a warm welcome from the enchanted staff of the castle, but the Beast will only let her father go if she stays. So she tearfully agrees. The drama is heightening. 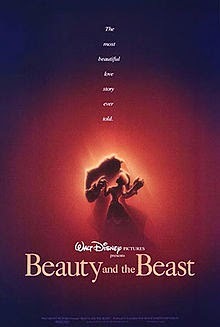 It is slow at first, but over time the Beast’s timid side is revealed, and he begins to fall for Belle. The breaking of the spell seems imminent and yet he reluctantly lets the homesick Belle go see her father again. However, Gaston has been working in the shadows and riles up a mob to lock Maurice away and then go after the child-killing Beast. Humanity must be saved from such a villainous creature after all. In typical Disney fashion, the final act is a wholly entertaining conclusion with an often uproarious skirmish between the villagers and the enchanted inhabitants of the castle. Top that off with a necessary final showdown, some passionate kisses, and some sumptuous final sequences, and everyone is happy. Disney has always been adept at making films with a wide range of appeal and they do it again here with their foolproof formula. They take a universal story and fill it with mellifluous music and absorbing visuals. The animation is often inventive and fun while the characters fill all the necessary spots. You have your villain, your beautiful girl, your anti-hero, a bickering clock and candle, along with a kindly teapot. What more could you want? I must say I am curious to watch the original French version La Belle et la Bete (1946) by Jean Cocteau to see how this version varies. Until then I am happily content with this film. This is the type of animated film audiences deserve to see and hopefully they will. Bonjour and Be Our Guest! This entry was posted in 1990s, Animation, Family, Fantasy and tagged Disney, Great Film, Review by 4StarFilmFan. Bookmark the permalink.